The 2017 Honda Civic is now the second model year this incredibly successful nameplate's tenth-generation. The Civic in all its various forms has now been in continuous production since as far back as 1972, and for the majority of that time it's not just been one of America's best-selling cars, it's actually been one of the biggest-selling cars in the whole world. The Civic enjoyed it latest complete redesign just last year as this illustrious compact entered its tenth-generation, and it's easy to see why it's still selling in such massive numbers when you take the time to look at it in some detail. This latest redesign may not be as radical and revolutionary as the previous-generation was compared to its predecessor, especially on the outside, but the latest incarnation is a stylish and contemporary as anything in its class. The 2017 Honda Civic is a superbly attractive car viewed from every angle, and it's very much the same when you climb inside. If there was anything even slightly polarizing about the interior of the previous generation Civic, it's hard to see how anyone could find fault with this newest take on the Civic. The 2017 Honda Civic invites you into its cabin with a broad, horizontal theme, which has a slight resemblance to a few current BMW models in the way some of its trim sweeps and bows. The thick trim at the driver's side of the car tapers away nicely as it continues towards the passenger door, and the door itself is paneled with attractive and upscale embossed metallic trim. The unique two-tier dash of the previous Civic generation is now consigned to history, and a five-inch color screen in lower trim levels of the latest Civic turns into a very user-friendly seven-inch touchscreen when it comes to higher trim levels in the current lineup. There are two different powerplants to select from in the 2017 Honda Civic as far as the vast majority of the range is concerned. The standard unit is all versions of the car a 2.0-liter inline-four producing a healthy 158 horsepower and 138 lb.-ft. of torque, which powers the front wheels through either a six-speed manual, or an automatic continuously variable transmission (CVT). It's a very good engine that has stood the test of time in previous cars, but as there's a relatively small charge for upgrading to the more powerful option it means it's probably going to be the less-popular of the two alternatives. The bigger of the two engines is actually something quite special as far as the Civic is concerned as it's the first turbocharged unit to find its way into the compact Honda. 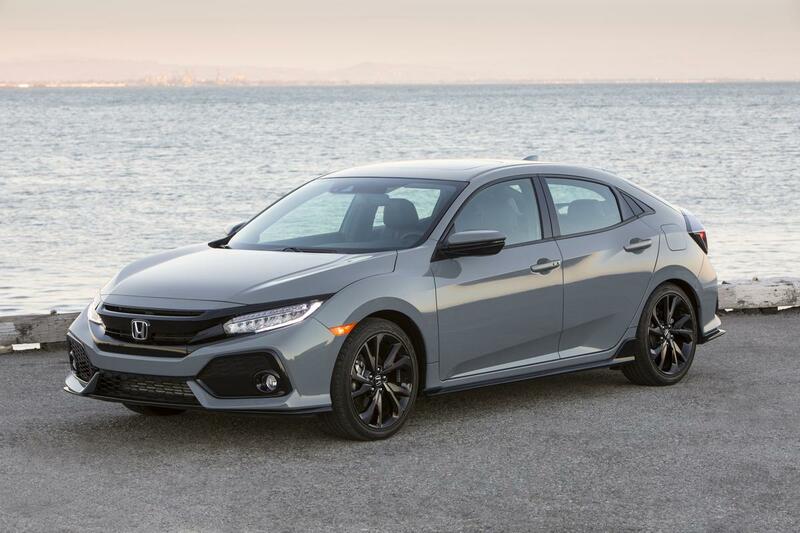 This genuine first for the Civic is 1.5-liter four-cylinder engine delivering 174 horsepower and 167 lb.-ft. of torque that can be specified with either a six-speed manual or the CVT transmission. There is another version of the 1.5 turbo, but this one is only found in the hatchback version of the 2017 Honda Civic in its Sport trim. This time it puts 180 horsepower and 177 lb.-ft. of torque at your disposal, and it's only available with the sporty six-speed manual transmission. While the sedan and coupe versions of the Civic are available in LX, EX, EX-T, EX-L and Touring trims, the new hatchback take on the Honda has a trim lineup comprising of LX, Sport, EX and EX-L Navi models.